You may have noticed that three different CDs of ours include the all-time classic, “Some of These Days,” by Sophie Tucker, recorded in 1911 for Edison. It first appeared on our Stomp and Swerve CD in 2003, and then again on Origins of the Red Hot Mama in 2009, and yet again on 1911: “Up, Up a Little Bit Higher,” which came out last year. There’s no questioning its significance in the history of American song. But how popular was it really at the time? 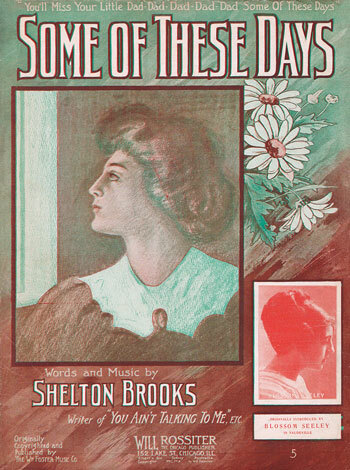 The American Quartet, with Billy Murray in the lead, recorded the Shelton Brooks song first: December 27, 1910, for Victor 16834. Elise Stevenson and the Columbia Quartette made it for Columbia A1029 on May 29, 1911. 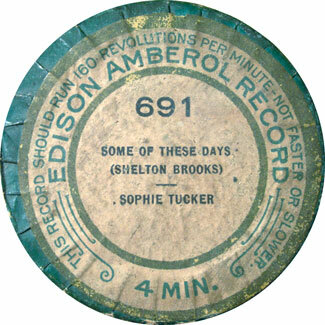 Sophie Tucker’s version for Edison was recorded around February-March 1911 and released in June 1911 on four-minute wax Amberol 691. The great thing about these original renditions is that you get the verses along with the chorus; when the song became popular again in the 1920s, nobody recorded the verses. Sophie’s is definitely the best of the bunch, and pop researcher Joel Whitburn suggests that it was a very popular record. Try to find a copy of the original cylinder today. When it does show up at auction, it goes for big money (we’re talking close to a thousand bucks), just like all of Tucker’s cylinders. One imperfect sign of a hit record is the persistence of copies today, and “Some of These Days” fails this test. We got to thinking about this the other day because we still are not clear why Sophie stopped making records between 1911 and late 1918. It’s true that most stage stars did not have recording careers—either they didn’t like recording or had schedules that never allowed for it—but Sophie’s activities in the studio both early on and in after-years shows that she wasn’t afraid of the acoustic horn or the electric microphone. 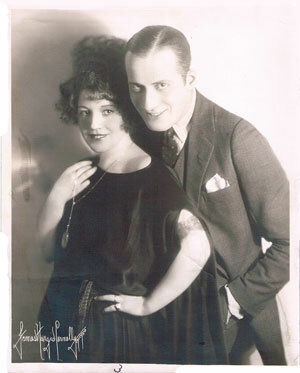 Stars like Nora Bayes and Al Jolson, on the other hand, kept one foot firmly on the stage and the other inside the studio. As a result we have a trove of their recordings today. Tucker began making records at a very tenuous time in the Edison business narrative. She debuted in early 1910 with selections on the old two-minute wax format, which was slowly being phased out in favor of the longer-playing wax Amberols, which had been introduced in 1908. Moreover, the wax compound Edison used for these late two-minute records was especially brittle and subject to degradation. Add that up and you see these are difficult records to find—especially in playable condition.